Having your own projector can have many benefits. You can use it at home to convert the backyard or the living room into a makeshift theater. Home projectors are also great for showing kids educational videos. 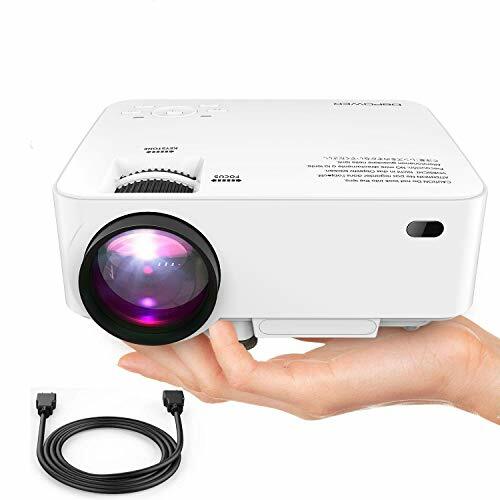 Small businesses may also prefer to have a small and portable projector on hand for presentations. Projectors are no longer confined to the high-end market. You can easily purchase a compact projector for budget-friendly prices. Picture quality, of course, will vary depending on your choice. Read ahead to find out more such choices in the list below. All the projectors on this list cost $100 or less. This iDGLAX projector is 2,000 lumens bright (or 50 ANSI). That’s about 70 percent more brightness than the average LED projector, especially at this price range. The above-average brightness is accompanied by an 800 x 480 native resolution. Though this resolution is not sufficient to support business presentations, it’s well-suited for home use. Plus, this projector is compatible with 1080p Full HD media. You can get an aspect ratio of 16:9 or 4:3 and contrast at 1000:1. You can expect a considerably large projection screen between 30 to 100 inches. The best distance is between 6 to 9 feet for a projection screen around 80 inches. In other words, this projector delivers exceptional brightness with all its basic features. It’s compatible with home theater systems and gaming consoles. As an extra perk, you will get a free HDMI cable to connect to a TV set. The projector supports VGA, USB, AV, and SD connections as well. You can connect the projector to a smartphone or a tablet if you have an HDMI adapter. The 5V output port can charge your smartphone. If there’s a downside, it’s the noise. The fan inside can be a bit noisy. For a tiny portable projector, the Apeman packs a punch. It has dual built-in speakers and operated with 3,500 lumens of power. It’s fully capable of rendering 1080p, Full HD images. There is a host of connections this projector supports including HDMI, VGA, USB, RF, PS4, and even smartphones. The Apeman is perfect for a home theater. 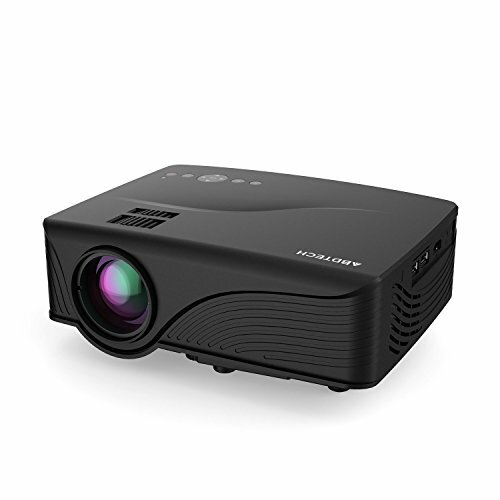 The projector uses the newest 4.0 LCD technology, which makes the projection particularly bright. The projection size reaches up to 180 inches. It’s suitable for the big screen experience. 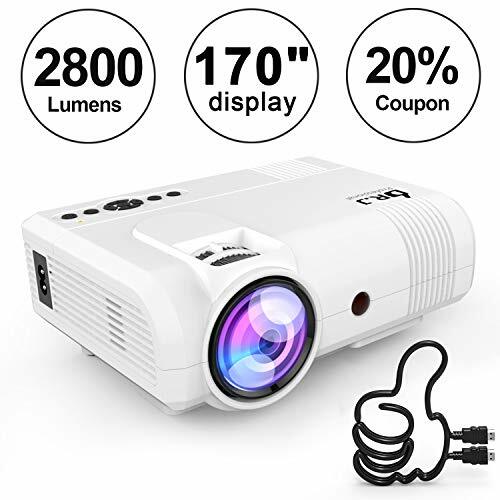 Thanks to the multiple connections, this projector is highly versatile. The energy consumption is significantly low. However, this projector doesn’t support Bluetooth or Wi-Fi connections. Everything has to be wired. There’s a decent cooling system inside to avoid dangerous overheating. The projector can handle a movie or two. However, don’t expect non-stop projection similar to a larger device. Overall, it’s a great device for the price. The only downside is audio, as you have to rely on the in-built speaker system. This projector is a high-res device capable of generating 1080p images. However, there are some caveats. Overall, the price overcomes the problems. Keep in mind that this is a 1,500 lumens projector. It’s not as bright as projectors that reach over 3,000 lumens. Therefore, purchase with caution. You would need a near completely dark room to use this projector. Even a bit of light could come in the way because of the lack of brightness. Other than that, the projector works fine. It can project to a large screen as big as 2 meters. 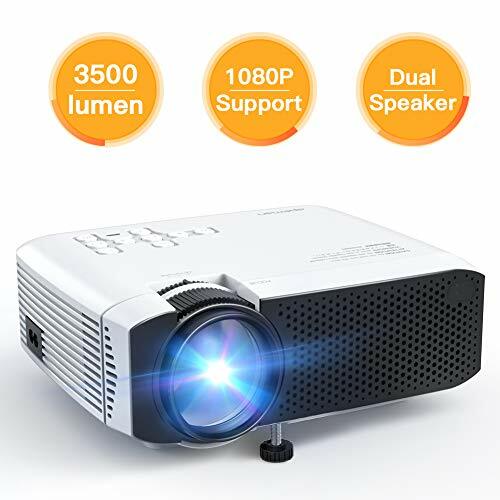 The projector is versatile and can be connected to a laptop, CD player, or a phone. No HDMI outlet is present. But you can use an HDMI adapter. This projector works surprisingly quietly too. It’s great for home use, especially in smaller rooms. This affordable projector doesn’t have any fancy features, but it’s decent enough to get the job done. It’s sturdy, versatile, and relatively noise-free, for starters. The projector is only 2,600 lumens bright. It’s not great, but not too weak either. You can get a really decent picture as long as you keep the room well and dark. The projector comes with a warranty. So if there are any defects, you can easily return in. You get versatile multimedia accessibility with this gadget. It connects to a host of devices including HDMI, VGA, USB, TF, and AV. Plus, You can connect this projector to a Fire TV stick. It works with a PS4, too. Though small, you can try using this in a home theater setup. The picture size isn’t massive, but it’s remarkably clear. It comes with an upgraded cooling system to work for prolonged periods. It won’t melt if you watch two or three movies straight. If you want a small projector for occasional home use, this is a good choice. It’s very portable and amazingly noise free. Most budget projectors come with fans that generate as much noise as video playback. The fan on this one has been upgraded to eliminate much of the loud noises (it still generates some sound though). It has all the necessary ports for home use, as well excellent compatibility with Apple products like Macs and iPhones. The projector works seamlessly with PC and Android devices as well. If you purchase directly from the manufacturer, you will get a 1-year warranty. I highly recommend the warranty because this is not a resilient projector. If you end up using it frequently, chances are high that it will break. How you go on about buying a projector depends on the above. 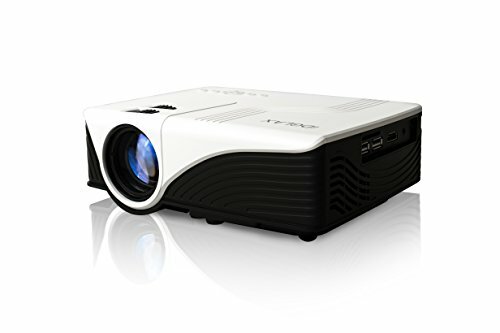 If you have a large screen, you will require a powerful projector, which usually cost north of $500. If you have an average screen designed for homes, a small budget projector would suffice. Different projectors have different projection lengths. Some can only handle 10 feet, while some others may be able to project from beyond 22 feet. When you buy the projector, consider this length carefully. If you are planning an indoor home theater, for example, you will need to measure the length of the room before you purchase the projector. Last, you will have to adjust the lighting in the environment to make it suitable for the projector. If you need to projector to work during daytime, you will have to shop for specific models. Assess your needs and carefully review if your projector is suitable for the purposes you want to fulfill. Buy a projector with a warranty just in case you want to return the product. So happy to have budget options out there !! Honestly i used to think that the portable projectors were too expensive. I havent try all the models that were reviewed but i can recomend the Goobang doo T22 too!! Really great life for a lens in the price range!